Musheer Hussain, Edward Fisher, Jonathan Fishman,	The Journal of Laryngology & Otology, Volume 132 Issue 8, p 669. S Konstantinidou, M Adams,	The Journal of Laryngology & Otology, Volume 132 Issue 8, pp 670-672. X Z Chen, S Y Feng, L H Chang, X P Lai, X H Chen, Xia Li, G H Zhang,	The Journal of Laryngology & Otology, Volume 132 Issue 8, pp 673-679. 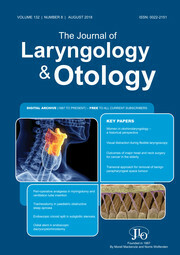 S Fray, A Biello, J Kwan, Y A Kram, K Lu, M Camacho,	The Journal of Laryngology & Otology, Volume 132 Issue 8, pp 680-684. B McHale, C D Badenhorst, C Low, D Blundell,	The Journal of Laryngology & Otology, Volume 132 Issue 8, pp 685-692. L X Ngui, I P Tang,	The Journal of Laryngology & Otology, Volume 132 Issue 8, pp 693-697. I McKay-Davies, K Selvarajah, M Neeff, H Sillars,	The Journal of Laryngology & Otology, Volume 132 Issue 8, pp 698-702. S Martens, I J M Dhooge, F K R Swinnen,	The Journal of Laryngology & Otology, Volume 132 Issue 8, pp 703-710. A K K Smith, T Sokdavy, C Sothea, M K R Pastrana, R F Ali, C T Huins, M P A Clark, J G Gollogly, M F Bhutta,	The Journal of Laryngology & Otology, Volume 132 Issue 8, pp 711-717. M E Dinc, S Ulusoy, E Sahin, N Bozan, M O Avincsal, B Tutar, Y Uyar,	The Journal of Laryngology & Otology, Volume 132 Issue 8, pp 718-723. Is there any effect of neurotrophin-3 on the pathogenesis of non-allergic nasal polyps? O Ismi, T Kara, G Polat, O Bobusoglu, Y Vayısoglu, K Gorur, C Ozcan,	The Journal of Laryngology & Otology, Volume 132 Issue 8, pp 724-728. D M Sparkman, M R Simmons, Y J Patil,	The Journal of Laryngology & Otology, Volume 132 Issue 8, pp 729-733. A K Abou-Foul, A Taghi, N S Tolley, Z Awad,	The Journal of Laryngology & Otology, Volume 132 Issue 8, pp 734-738. T C Biggs, A Henderson, F Shelton, N N Patel,	The Journal of Laryngology & Otology, Volume 132 Issue 8, pp 739-741. N Subramaniam, D Balasubramanian, P Rka, P Rathod, S Murthy, S Vidhyadharan, S Rajan, J Paul, K Thankappan, S Iyer,	The Journal of Laryngology & Otology, Volume 132 Issue 8, pp 742-747. Y Liu, H-J Yu, H-T Zhen,	The Journal of Laryngology & Otology, Volume 132 Issue 8, pp 748-752. S Carr, A Dritsoula, R Thevasagayam,	The Journal of Laryngology & Otology, Volume 132 Issue 8, pp 753-756. T Williams, B Tungland, N Stobbs, G Watson,	The Journal of Laryngology & Otology, Volume 132 Issue 8, pp 757-758.